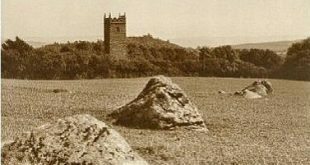 “Recently it was noticed by Mr. G. W. Copeland, of Plymouth, who reported his discovery to Mr. E. Masson Phillips, an authority on the ancient crosses of Devon. Mr. Phillips having inspected the stone, brought it to the notice of Rev. C. Mansfield, vicar of Dunsford and as a result Mr. Mansfield was convinced that the stone was really part of a cross, and now has taken steps to attempt to secure its preservation in a more suitable situation. The fragment consists of part of the shaft, with one arm, of a granite cross of regular octagonal section. The shaft above the arms and the other arm have been knocked off, and the extent of the shaft itself cannot be ascertained until the fragment is removed from its position. In type the cross is referable to the 14th or 15th century, and its character is in keeping with the possibility that it may have been the village cross or the churchyard cross. However, there is a local tradition that the cross once stood at the corner opposite East Hill House, Dunsford, and was known as St. Thomas’s Cross, and this is equally possible. Dunsford cross before and after relocation. Mr. Mansfield has written to St. Thomas Rural Council asking if the fragment may be removed and placed in Dunsford churchyard preparatory to finding for it a permanent resting place in keeping with its sacred associations. He has also communicated with the present squire of Dunsford and obtained his approval of the suggested scheme which consists simply of removal and preservation, no restoration of the mutilated fragment being contemplated at the present juncture.” – Western Morning News, January 13th, 1938. As can be seen from the above photograph the old cross was indeed relocated to Dunsford churchyard where it remains to this day. For those into vital statistics the height of the cross is 46 centimetres and the single arm spans 40 centimetres, its circumference is 78.5 centimetres. The cross can be found sitting just by the churchyard steps. Sandles, p.36. As noted above nobody is sure of the crosses original purpose but one local thought was that it may have been a preaching cross?